This scene has all the whistles and bells scratch built into it, quite literally. There's plenty of 'water traffic' interrupting the calm splashing of waves against the squeaking and creaking wharfs, the distant buoys and fog horns. You'll hear almost every type of ship horn and whistle passing by 'somewhere within earshot'. Everything is scratch built into this one, even the wind. Of course, there are a full compliment of seagulls and other critters. In the background is the city, there are horses and wagons, Model T & Model A cars and trucks and taxis horns, bells and even the occasional old time crank fire siren. There is plenty of activity in this one. Its a lush, vivid, and busy image, even during the most quiet passages. 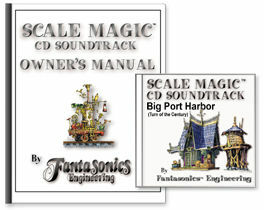 And as with all our soundtracks, its all created with out proprietary Scale Magic imaging to quietly sound huge... in a small space!